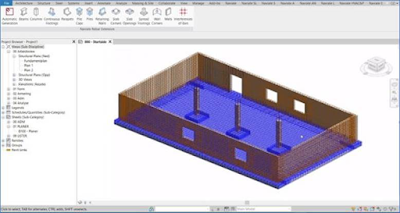 Automate the process of generating reinforcement for elements like beams, columns and piles. This application is Free for all Revit 2019 users, until further notice is given. When generating reinforcement for parameters like beams, columns and piles. With automatised processes for generation of reinforcement for elements like beams, columns and piles. After the extension generates the reinforcement, messages concerning the process of generating the reinforcement for individual elements, display. Note: You can generate the reinforcement for all elements except retaining walls and slab corners. Automatic reinforcement generation. Perform an automatic process of generating reinforcement for elements as beams, columns, piles. Beams. Generate reinforcement for a rectangular cross-section of a beam in an Revit and Robot. Columns. Generate reinforcement for rectangular and round cross-sections of an RC column in an Revit and Robot. Continuous footings. Generate reinforcement for a continuous footing in a Revit model. Reinforcement can be generated for the following types of footing cross-sections: Rectangular and Trapezoidal. Parapets. Generate reinforcement of a parapet defined in a Revit model. Pile caps. Generate reinforcement for a pile cap in a Revit model. It is possible to generate reinforcement for rectangular and triangular sections of a pile cap. Piles. Generate reinforcement of a pile defined in a Revit model. You can generate reinforcement for a single pile or a group of piles positioned under the pile cap. Retaining walls. Generate reinforcement for a retaining wall in a Revit model. Reinforcement can be generated for the following types of objects in Revit: Structure foundations in the shape of a typical retaining wall and foundations under walls of different shapes combining wall and foundation. Slab corners. Generate reinforcement for corners of slabs in a Revit model. Slab openings. Generate reinforcement of slab openings in a Revit model. Reinforcement can be generated for the following types of slab openings: rectangular openings, rectangular openings adjacent to one slab edge, rectangular openings adjacent to two slab edges and round openings. Spread footings. Generate reinforcement of a spread footing in an Revit and Robot. Reinforcement can be generated for the following types of footing cross-sections: Spread footing and adjoining column. Walls corners. Generate reinforcement of corners of walls defined in a Revit model. You can generate reinforcement for the following types of wall corners: Wall corners, Connection of walls and Intersection of two walls. Walls. Generate reinforcement of an wall in a Revit model. Interference of reinforcing bars. Perform an analysis of rebar interference existing in structure model of the Revit program. The module allows to analyse selected elements in structure model. If the elements have not been selected in structure model before the module activation, the analysis is carried out for the entire structure model. Naviate Rebar Extension is brought to you by Symetri. It's free.